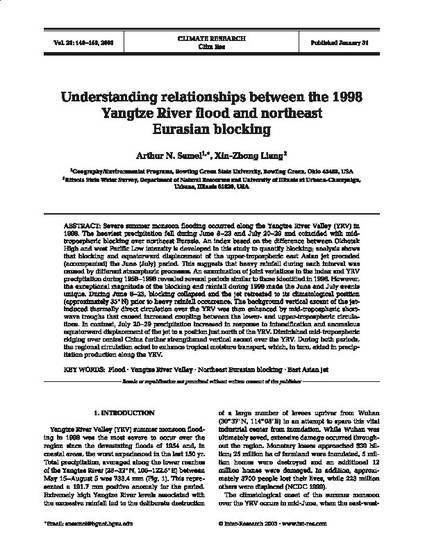 Severe summer monsoon flooding occurred along the Yangtze River Valley (YRV) in 1998. The heaviest precipitation fell during June 8-23 and July 20-29 and coincided with midtropospheric blocking over northeast Eurasia. An index based on the difference between Okhotsk High and west Pacific Low intensity is developed in this study to quantify blocking; analysis shows that blocking and equatorward displacement of the upper-tropospheric east Asian jet preceded (accompanied) the June (July) period. This suggests that heavy rainfall during each interval was caused by different atmospheric processes. An examination of joint variations in the index and YRV precipitation during 1958-1998 revealed several periods similar to those identified in 1998. However, the exceptional magnitude of the blocking and rainfall during 1998 made the June and July events unique. During June 8-23, blocking collapsed and the jet retreated to its climatological position (approximately 35degreesN) prior to heavy rainfall occurrence. The background vertical ascent of the jet-induced thermally direct circulation over the YRV was then enhanced by mid-tropospheric short-wave troughs that caused increased coupling between the lower- and upper-tropospheric circulations. In contrast, July 20-29 precipitation increased in response to intensification and anomalous equatorward displacement of the jet to a position just north of the YRV. Diminished mid-tropospheric ridging over central China further strengthened vertical ascent over the YRV. During both periods, the regional circulation acted to enhance tropical moisture transport, which, in turn, aided in precipitation production along the YRV.